Track your performance, optimize your social media campaigns, and show your social media strategy results with our comprehensive social media report template. Spend less time reporting and spend more time on growing your community & building your social media strategy. 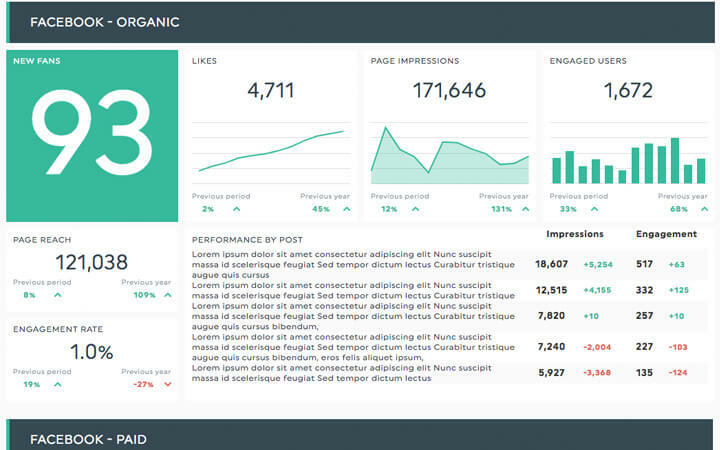 Our social media report template has everything you need to get your marketing team started quickly: it’s pre-built with the standard social media KPIs you need, and it’s fully customizable so that you can visualize the data you want, the way you want. The time of manual reporting in Excel and Powerpoint is now over! Our social media template includes the most widely used social media KPIs that will highlight your marketing efforts. Facebook, Twitter, LinkedIn, Instagram, Facebook Ads, LinkedIn Ads… we’ve got you covered! Or really any other metric you want! Want to see what these look like with your data? Create your own social media reports! Plugging your own data from across a multitude of social networks into our simple social media report template is as easy as 1-2-3! Include your Facebook, Twitter, Instagram, and LinkedIn data… all in the same report! 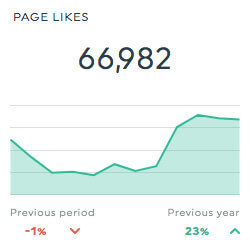 Choose the social media report template from the drop-down menu, and you’re all set! Why create individual reports for each social network you use? Combine all your social channels into just one template and see everything you need on a single page! Ready to create reports that include all the social media channel you need? 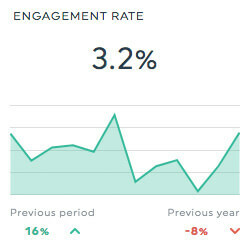 Pre-built social media marketing reports are awesome. But you know what’s even awesom-er? A fantastic social media report tool that helps you automate your entire reporting process made specially for social media managers. Quick, simple, and fully customizable. Right on! 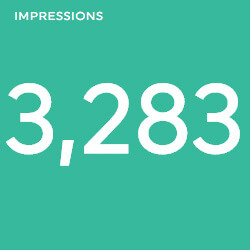 Want to add a few other KPIs to the ones we’ve already included in our sample social media analytics report? Choose from hundreds of preset widgets, or create your own custom widgets! Using our pre-built social media reporting example doesn’t mean you’re stuck in a rigid frame. Our template is super flexible; add section dividers, include your logo, attach images, and create custom widgets with the metrics, dimensions, segments, and filters of your choice. Speaking of flexibility and customization… our team here can create beautiful white label social media reports that reflect your brand! Customize everything from colours, fonts, layout… even the URL of the report itself! DashThis connects to many different social media platforms, so there’s really no end to the variety of KPIs, metrics, and layouts that you can use to showcase your data! Learn what content your audience engages with the most by tracking important Facebook page & Facebook ads metrics like impressions, engagement rate, and likes. Foster a positive brand image by recording the most important Twitter KPIs such as follower engagement rate, mentions, and top retweeted posts. Make sure your LinkedIn strategy is providing the ROI you’re looking for by tracking metrics like number of clicks, total social interactions, and LinkedIn impressions. Ensure that your Google + content strategy is performing as well as you want it to by following your total social interactions, number of replies, and followers count. Any YouTube report worth its salt should include video views, estimated minutes watched, and comments count among its KPIs! Social media reporting probably isn’t the only type of marketing reporting you do. That’s why we’ve created tons of other pre-built templates to help you track what you need quickly and easily! Organic traffic from search engines is often the biggest source of traffic for your business - keep an eye on your SEO and measure KPIs with our SEO report template! Your current AdWords reporting tool not cutting it? Here is everything you need to see your paid search marketing results in one comprehensive PPC report template! With our Google Analytics report template, you can gather all your clients’ website data in a single, nice-looking Google Analytics report!